With snow in the forecast for the high country, I knew that I would have to escape to the mountains very soon if I wanted to have a dry, fair-weather alpine hike. Although an Enchantment traverse was my initial plan, the thought of beginning and ending by the light of headlamp dissuaded me. I decided to scramble up Cashmere Mountain instead which would allow me a reasonable departure time and relatively early return without sacrificing the overwhelming feeling of satisfaction guaranteed by a hike in the alpine, as well as incredible views and a challenging 5,200 feet of elevation gain. By the time I arrived at Eighmile Trailhead, the clock read 8:30 and the sun had warmed the air sufficiently for shorts and a tee shirt. The forecast predicted a high in the 70’s with no chance for precipitation, which afforded me the opportunity to pack lightly. The trail begins with a comfortably mild incline, then steepens sharply at mile 2.8 as it switchbacks towards Lake Caroline and begins to gain elevation in earnest. It is near the shores of Lake Caroline that you are awarded your first view of Cashmere Mountain, a massive and jagged granite peak unparalleled on the horizon. It seems unbelievable that you will soon be standing on its highest pillar with nothing more than clever route-finding and class 3 scrambling. As you part ways with beautiful Lake Caroline and resume your upward trek towards Windy Pass, you will reach a switchback with an iconic view of Cashmere Mountain in the background and a high alpine meadow with a small meandering stream slightly below you in the foreground (at roughly 6,800 feet). Some parties elect to shave approximately one mile from their trip by descending to the meadow and taking a direct line to the ridgeline immediately left of the summit. I opted to remain on the main trail for my approach and descend through the meadow. After arriving at Windy Pass (which proved to be an accurate moniker with gusts in excess of 30 mph), the trail to the summit is easily distinguishable to the east. The peak of the mountain is easily dividable into two separate collections of granite spires. Many route descriptions advise zig-zagging through the west peak spires from the south face to the north face and back, then scrambling up various chimney and gullies on the eastern spires to reach the summit at the eastern edge of the east peak spires. I found that a much simpler and easier approach is to stay on the south side of the slope for the initial west peak spires, then cross to the north face of the slope and traverse low, resisting the temptation to commit to any chimneys or gullies until nearly the end of the formation. From the north side of the mountain and with the end of the summit formation in sight, a third class gully becomes visible above you. This gully is your ticket to avoiding any 4th class moves on your quest for the summit. The summit block is no bigger than a dinner table, but at 8,501 feet it affords you an amazing vantage point. The small size of the summit block combined with the aggressive 30 mph wind gusts only afforded me the opportunity to take a few obligatory summit pics before I retreated to a slightly more protected position to enjoy my lunch and rest my exhausted legs. Knowing that exhausted legs often crystallize into stiff legs after only a few minutes of inactivity, I didn’t spend long resting before I packed-up and retraced my path across the ridge. As I descended, the wind calmed and the temperatures warmed. 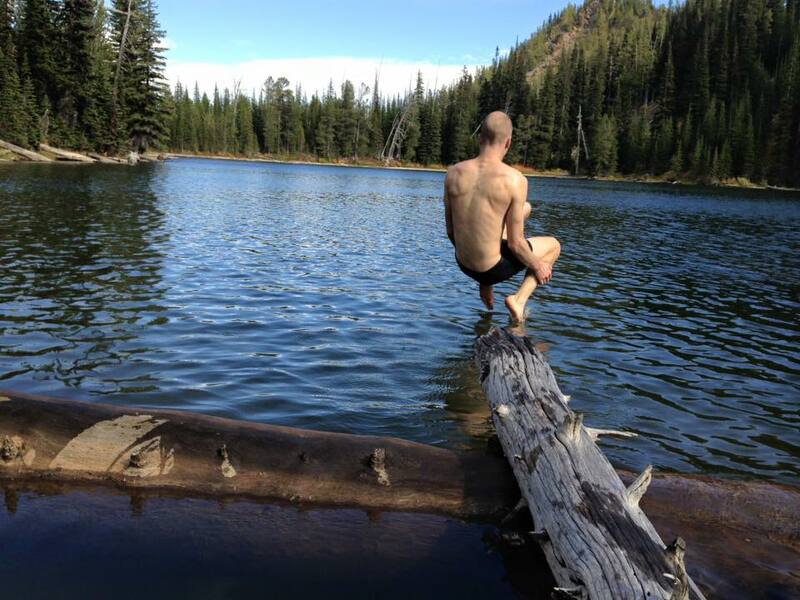 By the time I returned to Lake Caroline, her siren’s call had me cannonballing into her waters for a quick swim. The water was surprisingly warm and nothing could have complimented my hike better than to swim in the crystal clear water with Cashmere Mountain towering in the background. 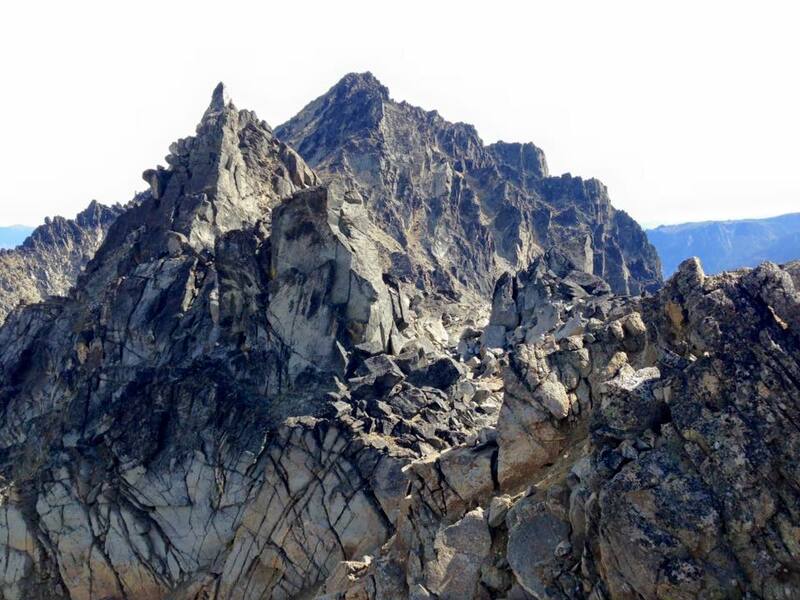 Difficulty: Hikers will find the scramble to the top of Cashmere to be an advanced hike (difficulty of 4). Mountaineers, on the other hand, will call this an easy scramble (difficulty of 1+ or 2-). In late spring through mid-summer there may be steep snow to traverse that could require crampons and an ice axe. 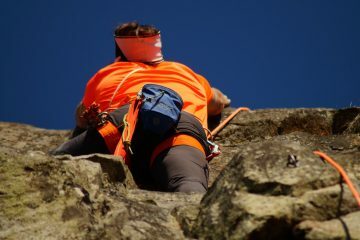 The final 300 vertical feet of the climb is third-class scrambling (you’ll use hands and feet but experienced climbers will not require a rope). Parts of this final scramble are exposed and losing your balance here could end badly. Fitness: Done as an overnight trip this requires slightly better than intermediate fitness (2+). As a day trip it requires advanced fitness (3). Distance: It’s roughly 8.5 to 9 miles from the Eightmile Lake Trailhead to the summit. Heading up the Goat Highway (see our map) is actually considerably shorter and more direct but this cross-country route can turn into a brush thrash if you don’t hit the goat trails right that lead up to the 5,600-foot level. Elevation: 5,300 vertical foot gain. Access: From Leavenworth take the Icicle River Road approximately 8 miles to the Bridge Creek Campground. Turn left on Road 7601 (Eightmile Road), cross the bridge over the Icicle Creek, and follow the road about 3 miles to the well-signed trailhead for Eightmile Lake. A Northwest Forest Pass is required to park. ⦁ The first 2.8 miles of this hike is the same trail (#1552) leading to Eightmile Lake. ⦁ At Little Eightmile Lake find the trail intersection and branch right on Trail #1554 leading to Lake Caroline. Follow the trail uphill to Lake Caroline, then onward to Little Lake Caroline (about 2.25 miles to Lake Caroline and 2.75 miles to Little Lake Caroline). Both Lake Caroline and Little Lake Caroline have good campsites but both are also in the Enchantments Camping Permit Area and require permits for camping. ⦁ Info about camping permits. ⦁ From Little Lake Caroline follow the trail another 0.8 miles toward Windy Pass. At an elevation of 6,850 feet, leave the trail and walk cross country in an easterly direction climbing slightly. After 0.5 miles and at the 7,100 foot level, there’s good camping (see ⦁ our map). ⦁ The peak of the mountain is easily dividable into two separate collections of granite spires. Many route descriptions advise zig-zagging through the west peak spires from the south face to the north face and back, then scrambling up various chimney and gullies on the eastern spires to reach the summit at the eastern edge of the east peak spires. Mark found that a simpler and easier approach is to stay on the south side of the slope for the initial west peak spires, then cross to the north face of the slope and traverse low, resisting the temptation to commit to any chimneys or gullies until nearly the end of the formation. From the north side of the mountain and with the end of the summit formation in sight, a third class gully becomes visible above you. This gully is your ticket to avoiding any 4th class moves on your quest for the summit. The summit block is no bigger than a dinner table, but at 8,501 feet it affords you an amazing vantage point. Map. 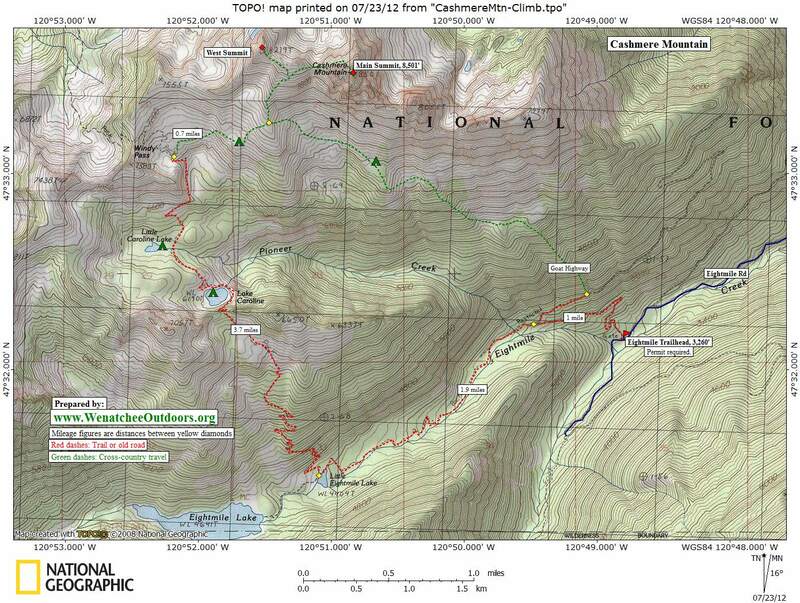 See our topo map of this route. Allowed. Hiking, climbing, skiing. This is in the Alpine Lakes Wilderness so no motorized vehicles, no mountain bikes, and no pets are allowed. Special Gear. Although not always needed in late summer and autumn, for much of the year an ice axe is recommended for climbing to the summit. A helmet is also a good idea. If climbing in spring, crampons are recommended. 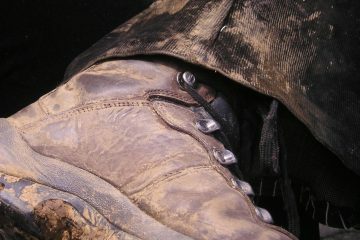 Approach shoes would be adequate in late summer but a lightweight boot is recommended if you’re likely to encounter any snow. More Info. More info about hiking to Caroline Lake is available through our hiking guidebook at this link. Also contact Okanogan-Wenatchee National Forest: Wenatchee River Ranger District Leavenworth, 509-548-2550. Permits. A Northwest Forest Pass is needed for parking at the trailhead. Fill out and carry a self-issue wilderness permit at the trailhead.